On my yoga mat Friday morning, I had a startling realization. As I moved through the poses with very little correction from the instructor, I thought: I feel like I know what I’m doing. I’ve learned a ton in the past few weeks. Those of you who know me know how much I struggle with stepping into new labels. But with each activity I’ve pursued–running, cycling, triathlon training–there’s come a moment where I’ve realized, Hey I know a thing or two about this and look at what my body can do! Having that moment on a yoga mat, I struggled once more with the label part (Does that make me a yogi? What does that even mean? Do I want to be a yogi?) but once I was able to sidestep the whir of my inner dialog, I thought of this blog’s Advice Column. Since people have found it helpful in the past to hear what I’ve learned about these things in the past, I thought I’d try my hand at some pointers for yoga newbies. 1) Chose classes over videos, at least in the beginning. Videos have the allure of being constantly available and being an over-scheduled Bostonian, I completely understand looking at a yoga studio schedule and throwing up your hands. And I know some of you would prefer to groan and sweat in the privacy of your own home. But videos can’t give you feedback on your poses, which can increase the chance of injury. Lack of feedback and constantly doing one video with one routine can also decrease the opportunity to attempt and slowly work your way into new, tougher poses. I’ve written before about the power of cycling with others to make you a better cyclists–the same principles apply here and it’s worth a little schedule juggling and potential embarrassment. Speaking of the embarrassment factor, I couldn’t reach lower than my shins in my first forward fold. Everyone in the class has started out that stiff or fallen over trying to do a simple balance pose. And in fact, a good portion of them probably have a story or two about relaxing to the point of farting in the studio. Yoga, unlike triathlons, isn’t meant to be a competitive sport and bodily functions like farting and sweating happen to all of us. It’s ok–you do you. 2) Don’t blow a ton of money on it right away. Even the yoga mat is optional–you’ll only really need it if you plan on practicing at home or you get skeeved out by mat sharing. Often studios will have mats you can borrow, for free for a small fee. If you’re practicing at home and find you need a block or two, you probably have a couple things lying around you could use for the time being. Need a strap? Grab an old necktie! You may get really into it and decide you want the unlimited membership, the dedicated apparel, a couple blocks, and a strap–but there’s no pressure to jump into all that sooner than you’re ready. In terms of class costs, yoga studios often have “community classes” that will run you $10 or less. 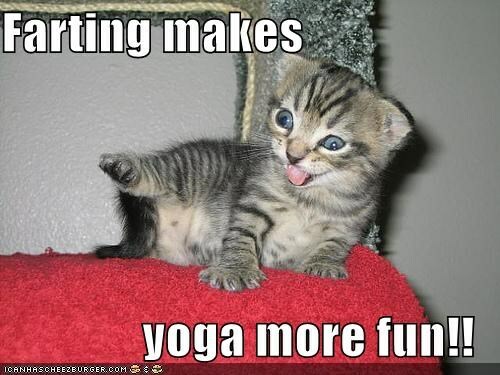 The yoga classes at the YMCA are build right into the membership fees. My friend Mary runs reasonably priced yoga classes, often through a local church, and there are a ton of independent instructors doing awesome stuff around town. Ask some friends and google around before you shell out big money at the splashy studios. 3) Proactively communicate with new instructors. Plan to arrive at your class ten minutes early–if you run chronically late, plan on twenty. Not only will this secure you the spot in the room you want (purely a matter of personal preference, but man it makes a difference in my stress levels not to have to be at the front! ), but it will give you time to chat a little with the instructor before class. If you’re new to yoga, tell them–often instructors will call out poses by name, but if they know you’re new, they may demonstrate more or at least choose the English names of the poses over intimidating names like chaturanga. It will also cue them to watch for alignment problems and additional feedback. Also tell them if you have injuries or medical conditions–they often know a ton about anatomy and can suggest modifications to poses that will work around any issues you may be dealing with. Finally, tell them if you do or do not want to be touched. Yoga instructors often find it easier to gently push or pull people into the right position, rather than try to describe verbally what needs to be adjusted. But it’s perfectly ok not to want to be touched by a stranger! In a discussion with friends about consent culture and hugging, I put it this way, “I get to determine who comes into my physical space, not the [other]. And I can offer my hugs to others but in the end they get to decide if I can come into their physical space.” You set the terms for correction and modification–a good instructor will respect the limits you set, but they can’t do that if you don’t communicate them first. 4) Try out a bunch of instructors. Do they explain the poses in a way that works for you? Do they set a tone for the class that you’re comfortable with? Do they strike the right balance of talking and silence for your tastes? Do they encourage/correct you to the degree and in the manner that you were hoping for? Do they make themselves available before and/or after the class and answer questions clearly and helpfully? There are a ton more–and probably at least one that’s very specific to you–but as you try out different instructors, you’ll probably begin to get a feel for what’s important to you. 5) Listen to your gut. Speaking of getting “a feel” that’s unique to your experience, be sure to pay attention to that little voice that lives somewhere behind your navel. Notice how you feel when you walk into the studio space. Does it feel too spiritual or too commercial for you? Does it feel to cramped or too expansive? How do you feel about the lighting? the temperature? the smell? All these little things will enhance or detract from your experience of the class and maybe even effect your ability to concentrate. Notice too how you feel about your interactions with the people in the studio. This includes the front desk staff–they will often set the tone as you begin your class. (Recently, I had the unfortunate experience of checking in while the front desk staff gossiped about the people in the last class. I will not be returning.) This also includes the instructor, as mentioned above, and the folks in the class–different studios and different instructors tend to draw different crowds, so just make sure you’re hanging with a crew you feel good about. And finally, notice how your body feels when you move into a pose and trust your gut when it tells you that you can push a little harder or that you should back off a little. Sometimes I get in a pose and it feels so awesome my gut nudges me to stay there instead of moving on with the class. Yoga practice is individual and self-awareness is one of your best tools to getting the most out of it for you in a sustainable way. If not before your first class, then definitely before you buy that membership, make sure your clear on why you’re doing yoga in the first place. Are you looking for increased flexibility? That’s where I started: I called it my tie-my-own-shoes-while-training strategy. Are you interested in building strength with out the weights, machines, or aerobics class vibe? Or maybe you’re simply looking for a means of getting in touch with your body or have realized that you meditate/pray best when you’re moving. Setting an intention will help keep you motivated and will help you focus on encouraging moments of growth along the way. Are there other barriers you’ve encountered to beginning a yoga practice? Other strategies that worked to help you get started? Share them below! Posted on May 24, 2014 September 21, 2018 by egcharismollingPosted in The Advice ColumnTagged advice, inspiration, Physical exercise, yoga. Previous Previous post: Why are habits hard to break?